December 01, 2016, 3:22 p.m.
Sunday has historically been the most important day of the week in Britain. Ever since the Middle Ages, Sunday has been an important day of rest and worship. Even today, the law still restricts stores from opening past a certain amount of time in order to preserve the sanctity of Sundays. 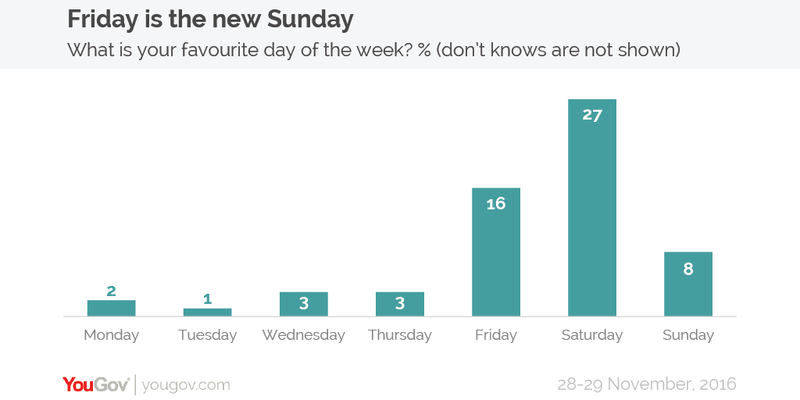 Despite this, and the obvious advantage that Sunday is one of the two days that most people will have off, new YouGov research has now revealed that people are twice as likely to say that Friday is their favourite day of the week as they are Sunday (6%). Fridays are especially popular among younger people, for whom the day is more than three times as popular as Sunday (21% vs 6%). Saturday is unsurprisingly the most popular day of the week, with 27% of people saying it is their favourite day of the week. Garfield the cat famously hates Mondays, and whilst the British public clearly feels the same way (just 2% say it is the favourite day) it is not the least popular day. That honour falls to Tuesday, which was the favourite day of the week for just 1% of people. In terms of people’s favourite seasons, the summer is the stand out winner on 44%. Spring is a distant second on 24%, whilst Autumn and Winter trail on 13% and 7% respectively. There is an interesting age dimension to people’s favourite season. 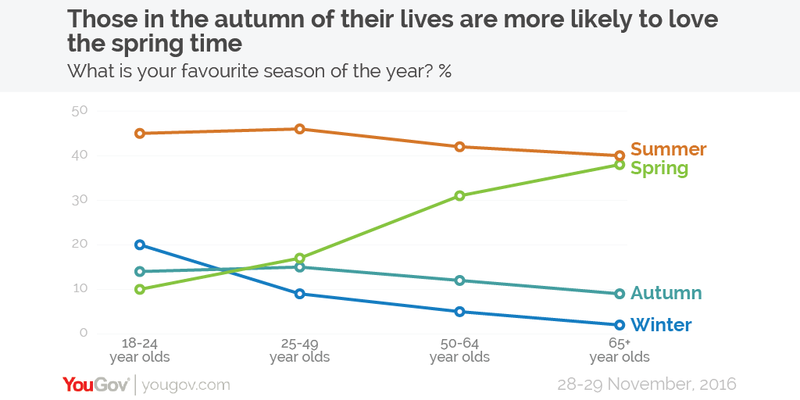 Whilst the proportion of people who favour the summer or the autumn is roughly the same across age groups, it seems that people prefer spring and disdain winter as they get older. Whilst just 10% of 18-24 year olds say that spring is their favourite season, this increases with each age group to 38% of 65+ year olds, making it about as popular as summer among that age group. By contrast, whilst one in five (20%) people aged between 18 and 24 say winter is their favourite season, this declines with each age group to just 2% of 65+ year olds.